I don’t know about you or your political opinion, but I’d like to think I know mine and the general consensus of those I have the pleasure of spending time with. Who in their right mind puts Mitt Romney as the forerunner for the GOP Presidential Candidate for 2012?! According to BBC News, Romney “leads the pack in polling and fundraising” (all sources linked to at the bottom of the article). But why? Mitt Romney’s history has leaned further and further “moderate” and “politically correct” than any of the current presidential candidates. Which includes Mr. Huntsman and his resume of being political ambassador to China. favorite to the media or to die-hard republicans? 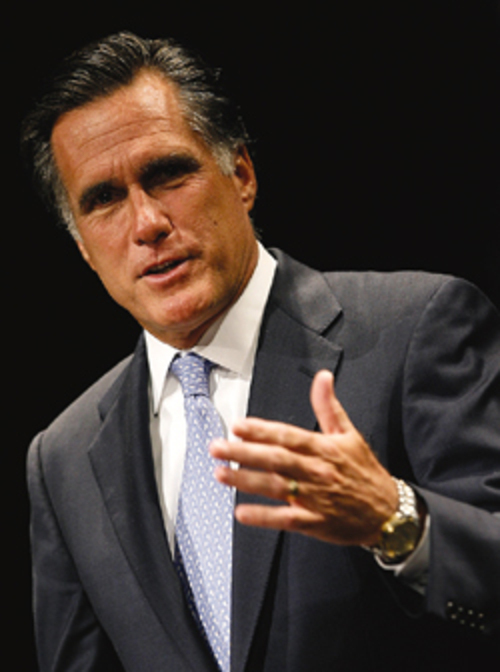 Although Romney leads in the polls with 17%, his gains and rhetoric are wanning on the election front. The democrats would love him to run against Obama. Why? Not enough clash. His appeal with college undergraduates is expected. Undergraduates want to be taken care of on two fronts–health and education. Two major issues led by democrats in the form of educational stimulus packages and health care extensions. Both of which Romney appears to fully support. It’s no wonder why college graduates (once they get into paying jobs and salaries of their own) tend to lose favor with the man they respected before! At this crucial time, republicans need a candidate that can hold their own in and out of office. A face that Americans can rely on overseas and domestically. In general, republicans seem to have the tendency to select candidates that cannot clash with the democratic party base–stretching their issues too thin and refusing to focus on their core goals. Why choose a candidate who speaks like a president but never acts like one? Romney leads the polls because he can keep his head level in a debate and can toss his “experience” around like a first-place medal. But will it be enough to sway the 22% of republican voters that haven’t made a decision yet? I don’t think so. There are two people we need to watch out for: Rick Perry and Herman Cain. pointing at the future or harping on the past? Rick Perry is about to make things “very clear” to the minds of republicans and with his track record, I’m sure it’s going to be a clear challenge to all the potential candidates what he brings to the table. He has a high record of fiscal conservatism, job creation, not to mention the growth of Texas’s economy due to the lack of state income tax. Talk about speaking to the economy first mindset! If Texas seceded, they’d have the world’s 13th largest economy. Maybe only for a week, but they’d have it AND the support of other nations. Because, really, when has an economic sanction against any nation from the U.S. ever worked? In addition, his years in an executive governmental office have him way ahead of the game. However, what’s so special about Hermain Cain? Hermain Cain former CEO of Godfather’s Pizza really created a stir among republicans last night, so much so that some sources cite him third in line behind Romney and Bachman. Great! Cain knows how and why the economy works the way it does. Of course, he’s definitely not well known. Cain has never been in politics. Which in my opinion, makes him one to watch closely. will economic experience win over political contenders? He has direct rhetoric and unfailing ground on the economic issues. He states debate as problems and goals that need to be worked on or achieved. His language is simple, sincere, and genuine. His ability to take an issue like the border and define it into four distinct areas of analysis is something many candidates still lack. Also, his ability to recognize his own faults and growth from those faults (such as his previous lack of knowledge on the mideast) shows adaptability. His acknowledgment towards his advisors and staff in hot bed issues show his willingness to incorporate many opinions and directions before making a decision. Honestly, why isn’t further along in this race, I’ll never know! Republicans need more than a president who will bash the other party, throw insults at the opposing members of their own party, and refuse to compromise. They need a humble, respectful, and dedicated leader that knows both the economic and international sector well enough to run our nation home and abroad. Who is that strong, contrasting candidate? Who knows? But they have to get the entire American working (and non working) class. On a premise that speaks to a nation at its heart and wallet, regardless of party. And Sarah Palin? Well, I guess we just have to wait and see if anything happens.